The average cost of a knee replacement in the U.S. is $35,000—a sizeable sum and many times what it costs in the best-value locales overseas. A new report from the editors at InternationalLiving.com explores five retirement havens where the quality of healthcare care is top-notch—but prices are so low that for the cost of the surgery Stateside, an expat could not only have the procedure done abroad, but also cover living costs for a full year or more. With rising costs of surgery in the U.S. we see more and more people going overseas as medical tourists. “Typically, a knee replacement costs $35,000 in the United States,” says International Living Executive Editor, Jennifer Stevens. “Take that amount to one of the best-value locales we recommend abroad—places where where healthcare is high quality but prices are low—and you could not only have your knee replaced by a well-qualified surgeon in a state-of-the-art facility, but you could also afford to take a year off and relax—all expenses paid. The International Living report details five great retirement hubs that offer knee replacements at a fraction of the U.S. cost. Mexico has long been a favorite for expats looking for a haven where they can make the most of their retirement, full- or part-time. The country’s close proximity to the U.S. and Canada—as well as its affordable cost of living and great healthcare—attracts folks looking for a nearby option. 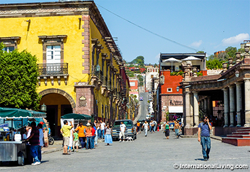 When Patrice needed not one but two knee replacements, she found the level of care and professionalism among medical staff in the nearby city of Queretaro to be first-class—not to mention significantly cheaper than in the States. “Several people have expressed surprise when I shared that I was not in major excruciating pain from having both knees replaced at the same time,” she says. “When I interviewed Dr. Fidel Dobarganes I asked many questions about the pain issue. He assured me that he has a pain-management plan that works, that it did not involve addictive drugs, and that on a post-op patient survey of pain level ranked 1-10, his patients scored 2 as the average. It proved to be true. Panama provides affordable, good-quality healthcare, anchored by the excellent clinics and hospitals in Panama City, which enjoys a top-notch reputation throughout Latin America. Clinics and hospitals are strategically positioned throughout Panama, however, and so it’s rare that retirees find themselves based more than an hour from a modern facility. One of the great benefits for foreign residents living in Ecuador is high-quality, low-cost healthcare. IL Correspondent Donna Stiteler lives in Ecuador’s third-largest city and the economic center of the Southern Sierra, Cuenca. France offers a healthcare system that is world-class. And prices typically run well below those in the States. “What about a car? From the change left over from your knee bill, you could buy a classic Jaguar XJS 1988—just the thing for the narrow medieval streets of sophisticated France. “And for those who really want to impress their friends back home, what about a bottle of France’s top-notch wine, DRC Domaine de la Romanee-Conti Grand Cru, Cote de Nuits. A lovely drop to crack open at your next cook-out with the neighbors. You can pick a bottle up for around $16,000 and still have a little left over to pay for the steak. IL Italy Correspondent, Valerie Schneider says, “a knee replacement if you go private and pay, costs about $22,729. That’s savings of more than $12,000—you could rent a country villa in Tuscany with pool for eight weeks at $1,500 a week. Or it would buy you a pair of Vespa motor scooters to explore Italy and still have money left for the insurance and gas for a couple of years. “If you have insurance coverage, the cost of the surgery would depend on coverage but range between $1,200 to $3,000. If you are enrolled in Italy's national healthcare system, the cost is zero. That means that you could conceivably buy a house in Italy with the same money as it would have cost just to get your knee replaced back home—yes, there are village homes for sale at that price! Or you could buy a sporty Alfa Romeo—along with insurance coverage. Southeast Asia offers incredible value for money and is becoming increasingly popular on folks’ retirement radars as a place to vacation while test-driving retirement overseas. Vietnam has a lot to offer its growing expat population—it’s a brilliant blend of East and West. A vibrant destination, steeped in history and brimming with opportunity. When it comes to bang for your buck, Vietnam is at the top of the list. And the country is full of surprises—and wonder. Until recently, most expats in Vietnam chose to seek medical care in Bangkok, Kuala Lumpur, or Singapore for all but the simplest procedures. In the past few years, however, Vietnam’s healthcare system has improved dramatically.